I pop in to town from time to time, every week or two. I have noticed a few shops that have closed down, some for a long time now. But today it really hit me just how many are now closed, and have not been replaced with new businesses. Walking in to Princess Square, 6 of the first 8 shops are empty. The high street is full of empty shops. I noticed today that the Thornton's chocolate stand has gone. Indeed, several of the shops I planned to visit have gone. I am pleased to see Bracknell Cycles have only moved, not closed down. But the overall impression is that it is turning in to a ghost town. Scary. Well, cash flow has been a tad off this month, and finally I have tracked it down. Things like this niggle at me, as you can imagine. Thanks to the customer that raised this - actually telling me that we gave him extra credit. He did not have to, but it was useful understanding what happened. The problem is the Queen's Jubilee! Or more specifically the extra bank holiday right at the start of the month. We have a number of customers who are billed on 1st of each month but selected Direct Debit on the 9th. Well, obviously "the 9th" has some leeway as it could be a weekend, etc, but within a couple of days on or after the 9th is how it normally works. We allow people to pick one of four dates during the month for collection of Direct Debits. The problem is that people billed on 1st June could not get the agreed notice for Direct Debits (we work on 5 working days notice) before the 9th, or 10th, or 11th. Normally this does not happen, but the extra bank holiday pushed it too far, and the cautious programming in the accounts system erred on the side of the customer and gave all those affected an extra month's credit. So hundreds of people billed on 1st June are paying on 9th July rather than around 12th June. The system did what it was told, it was not actually an error (which is why we had trouble finding it), but I have changed the rules for the future. It now allows 3 working days after the "agreed" day in the month. By allowing working days it should cope with things like this (which could happen for an Easter). The DD rules allow 3 working days after notified collection date so this is consistent with the rules, even though it would mean notifying a later date in our case. The invoices we sent were, of course, right, and clearly stated the extra (interest free) credit terms. The DD notices are, of course, right. The payments are not seen as "late" and no penalties charged. The system did what it was told! Am I just getting cynical in my old age I wonder? At least we have made changes to avoid this confusion in future. It is one thing making any sort of mistake, but another not to learn from it. I have wondered if I could have a shorter email address. Something like x@e.gg is pretty short, but what of say e@gg ? My understanding is that the guy running gg actually tried it, and found it did not work. Partly down to email clients, but annoyingly, whilst a top level domain can have an MX record, it is actually part of the RFC that disallows this. So it used to allow a domain with no dots in it, but now requires dots. Shame, especially for many of those applying for new TLDs as they cannot have things like info@google as an email address. Update: See comments as it seems I missed something and such email addresses are valid, just unlikely to work. 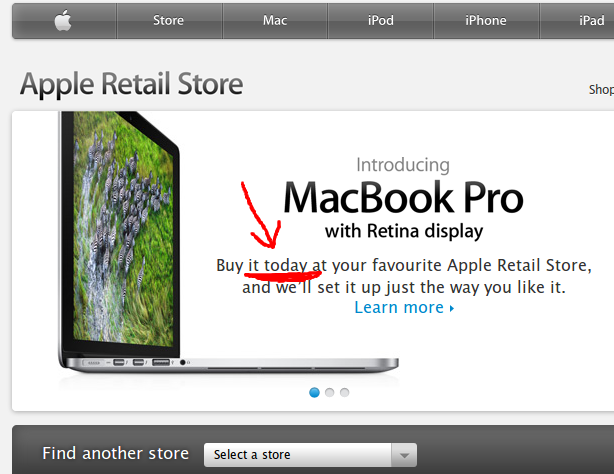 So, Apple's web site say "But it today at your favourite Apple Retail Store". 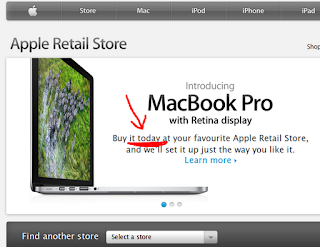 Well, according the the Oracle Reading store, not only does my favourtite Apple Retail Store not have any for me to buy today, none of the stores do. I am not amused by the misleading advertising. I have done some more research on this. Basically, we are working to make an "info pack" for the broadband lines. We have had these for a long time, but they have not been updated for new types of line (FTTC) and products (SIMs, etc). 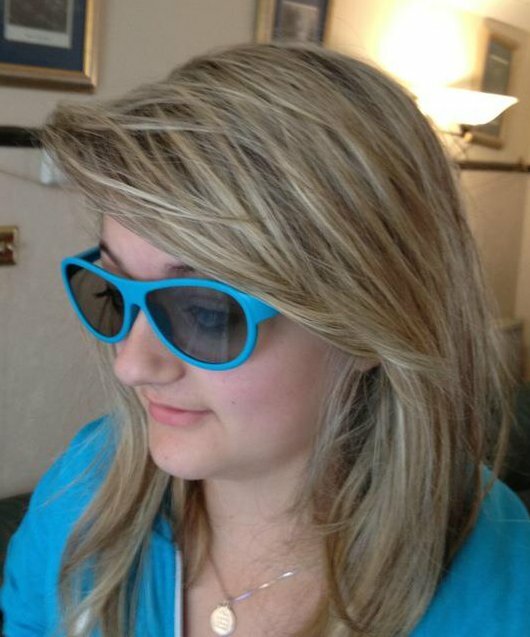 The reason being that nobody but me knew how to udpate them. The way we used to work turns out to be sensible in many ways - it was generating postscript from scripts and then using ps2pdf to make a PDF or simply sending to the printer. The trick is (a) how to generate the postscript in a more maintainable way, and (b) what sort of postscript makes for a good PDF. We want something that is a lot more maintainable than the previous scripts, and something that other staff can update with no knowledge of postscript. Either that or I do some training on postscript, which I may do anyway. So, what we are doing is, in most cases, using an svg master for a page - editing in inkscape. We have a simple text substitution script to allow some embedded values. SVG is good for this as is allows simple graphics, embedding of images, and text. The text can be positioned text or flowed paragraphs. The latter is very good when we are embedding data, such as line numbers, names, IP addresses, etc. We convert this to postscript. We can then work on the postscript to do things like add page numbers, reorder and resize to make an A5 booklet, and all sorts. The final result can go through ps2pdf to make a good PDF. This creates a PDF that is compact and has text you can search and select and so on. It allows copy/paste from the PDF nicely, regardless of font used. The problem is that a graphical editing tool like inkscape is outputting postscript for the purpose of printing. It knows the metrics of the fonts in use, and positions characters. Because postscript does not do utf-8, it will mess with character coding. It will produce output which prints, but not output which makes for a nice PDF. What is worse is that any issue with font metrics creates PDF that looks horrid. We got close by telling inkscape to make a PDF, and then using ps2ps to make a postscript from that, but that only worked with the very basic fonts like Helvetica, for some reason, otherwise you could not copy/paste from the document. So, back to basics - hand made postscript works, is small, can do things like flowed text and right alignment using the font metrics internally. It makes for good PDFs regardless of font used. How to get simple "hand made" postscript from easy to edit SVG files? Make your own tool. So I have. It is limited in what it understands, but it works for graphics, text, flowed text, and embedded png images. That is all we need. The new info packs will be on the A&A control pages soon. Well, for 5 days now we have seen some major issues on all 21CN Guildford BRASs. BT have not been able to fix this, or even investigate this! So what can I say? You decide if they are competent to run a major UK broadband back-haul network. The latest issue, FYI, is complicated, but we are more than happy to provide as much diagnostics as possible. We monitor every line every second thanks to FireBrick LNSs. We see two issues, no doubt related, and only on 21CN Guildford BRASs. Packet loss in evenings (afternoons as well, over the weekend) but only on some specific BRAS/LNS connections. Huge latency (evenings), but only on some lines. The first point is specific to LNS/BRAS links, and adding new IP addresses to our LNSs can fix the problem. My conclusion is a typical LAG/hash issue. Some traffic based on IP/ports is via a congested link, and some is not. We see loss over 5% on this. The second is more random and transient. Lines lose or gain this issue on PPP restart. My guess is the same issue on the other side. It probably includes PPPoE aspects like session number in the hash, and has different characteristics when full. We see latency to 100ms on this. Some lines have no issue, some have latency, some loss, some both. But are BT up to the job of finding the cause? Who knows. And as for account managers in BT who actually "care". We had one once, but no more. Other ISPs please note - Guildford BRAS issues. P.S. I have spent hours on this over this evening alone allocating new IPs to LNSs and bouncing links to get them clean. If BT cannot sort soon I will be working on new systems to allocate specific IPs for specific BRAS links to bypass this. Its is complex working around such a major outage but something we are willing to do to get AAISP customers the best service, even if this does affect all other BT connected ISPs. Update: After several days BT have found a VLAN that is running hot. You would hope they monitor these things, wouldn't you! Waiting on a PEW to get it fixed now. P.S. The incident team are actually quite helpful, but at the end of the day they are just calling BT Operate. Most of the people we know in BT Operate are quite helpful too. Nice, helpful people being unable to actually sort the problem makes it more frustrating in many ways. I hope they do get their act together so that they can see this sort of stuff and not wait for us to report it. Update: Well over a week late we still have the latency issue... Thankfully the one man in BT with clue is back off holiday and will be on the case for me soon. 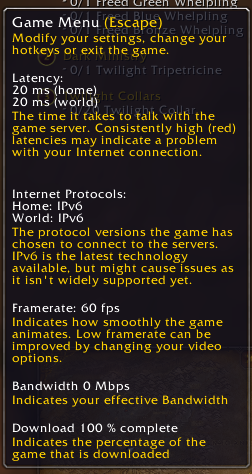 Well, Blizzard have out done themselves, managing to get IPv6 enabled on US and EU servers in time for today's World IPv6 Launch. Well done. Shame you have to tick a tick box, but otherwise it just works. A trace from London where our DSL lines connect shows direct to HE over LINX and then in to Telia. I assume Blizzard are connected via them as the trace stops at firewalls there. 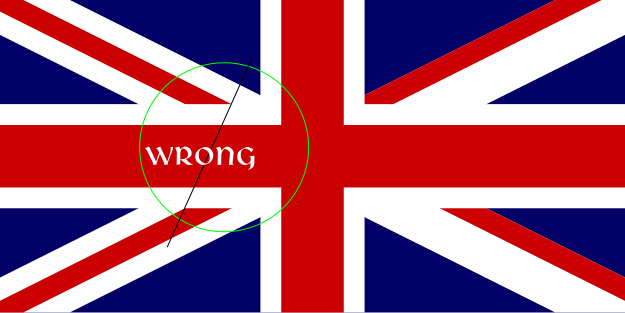 Having seen so many union flags done wrong this weekend, here is my simple guide of how to tell a good flag from a bad one. It is not hard to tell once you know, and it is a curse, just like learning correct grammar is a curse. One issue with spotting a duff flag is that you do not always see all of the flag. 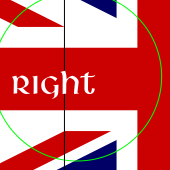 Some times you have a stylised design showing part of a flag. Even so, there are clues. I am not going to try and mention colours (yes, the blue is meant to be quite dark compared to the red), ratios (as the design rules allow for different ratios, and there are several in use, though 2:1 seems "normal"), or try and cover every way it can be wrong, just the main ones. These are all things you can see without needing a ruler (no, I do not mean without a King/Queen, I mean without measuring things). 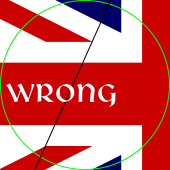 The red diagonal cross is not the same as the original St. Patrick flag but sort of shifted anti-clockwise slightly. 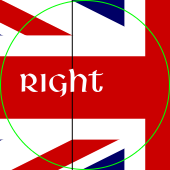 It means that the red diagonal cross is lower on the left side than the right when viewed with flag pole on the left. When no flag pole you assume it is on the left. Otherwise it is upside down (supposedly a sign of duress). At each corner one edge the St. Patrick red cross touches the corner exactly. It is either the top or bottom edge depending on the corner (see point 1 above). 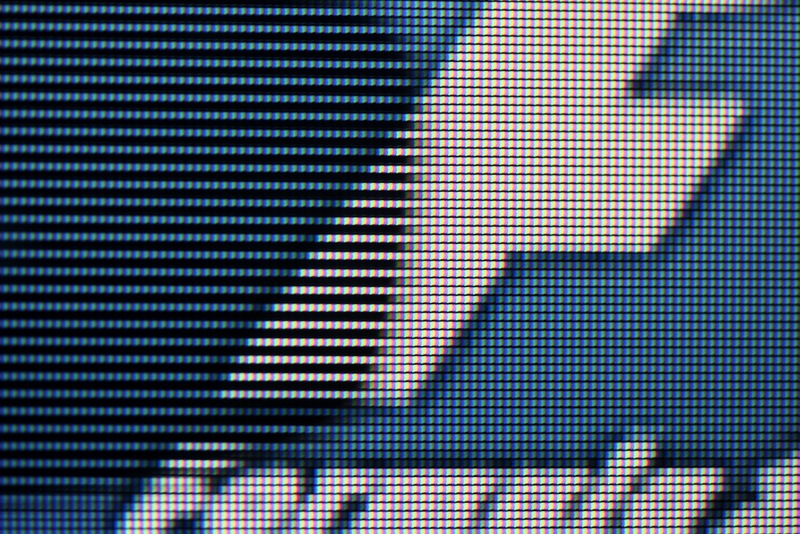 It is not centred on the corner or missing it at all. The white St. Andrew cross on blue does meet at the corners and is centred on the diagonal. 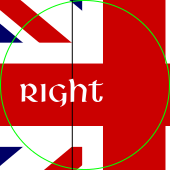 In fact, the white:red:white ratios are 1:2:3 and the total thickness of the white cross is 1/5th of the overall height of the flag (the same as the thickness of the red part of the St. Georges red cross in the centre). 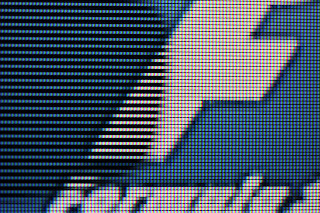 You cannot always see the corners, e.g. when the flag is on triangular pennant or some other stylised version. You can, however, spot simple mistakes. 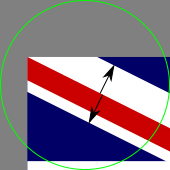 The diagonal lines of the St. Patrick's cross meet the red St. George's cross in different ways depending on the ratio of the flag, but the top and bottom diagonals do not meet in the same way - in fact the top left diagonal must have its right hand edge aligned with the left hand edge of the bottom left diagonal where it meets the centre. i.e. I saw an interesting post on twitter about this. I had posted about the fact that our pricing is (and always has been) based on days of the week and not whether they are a public holiday or not. The exception being that we usually do a special Christmas rate for that week. Apparently the post was condescending, and I do apologise for that. It is a tad frustrating handling some of the questions we get on this, and we really do try to make it crystal clear how the charging works. We are not trying to trick people, and there are a lot of industries and services where pricing is not affected by public holidays. We do close sales, accounts and support over public holidays, but that is mainly for the same reasons we only work 9 to 5. Getting engineers out on public holidays is almost impossible, so taking calls outside normal working hours is not usually going to help fix a problem any quicker. Various people are working during the weekend anyway, and we do have support on irc by various staff giving their own time. We also have people ready to handle any major outages whatever the time. So it is not that we are not working. But one comment was that our pricing is unsustainable because of IPTV. This is an interesting view, and got me thinking. It is not, as suggested, why the posting was made. To be honest, that was to try and make sure people did not make assumptions and regret it later - I was trying to help, honest. IPTV means there is now a gradual increase in the usage of broadband lines. More and more people are starting to do some streaming and downloading of video that did not before. This is an issue in the industry, obviously. One of the main problems is that back-haul from a customer premises to a handover point in the UK costs 10 times what connectivity from an ISP to the rest of the world costs. Yes, it seems crazy that a company that only has to link a few hundred exchanges in a small geographic area charges so much more than companies linking thousands interconnects all over the globe. However, the upshot of this is simple, IPTV is increasing costs for ISPs. It does vary from ISP to ISP and depends how they connect to customers. Some ISPs with exchange equipment are in a better position to cope, those using BT back-haul are not so much. But either way, it means people spending more upgrading links from exchanges. That does cost money. So that leads me to ponder what is a sustainable pricing model for an ISP. One where prices relate to costs in some way (like us), and increased usage (because of IPTV or otherwise) means both increased costs and increased revenues... Or, a business model where price competition drives prices down, and ISPs offer "all you can eat" services where IPTV increases costs. What do I think? Well, I am not an economist, but I think that this all puts pressure on the back-haul links and their costs. I think competing on price is less sustainable, to be honest. Transit costs have plummeted over the years as usage has increased, but back-haul has reduced more slowly. What I hope is that pressure on the back-haul pricing means that it gets a lot cheaper. That means we can lower our prices to customers. Even so, I don't see us competing on price - it means compromising far too much on other aspects of the service, and means potentially running an unsustainable model. We intend to stay in business. Eventually, back-haul links will be high enough capacity for fixed pricing models to be viable. When that happens we will offer them. Having said that, we are trialling some interesting options for businesses even now, with much more affordable, fixed price, all-you-can-eat Internet links using FTTC and Etherflows. They are not cheap enough for residential use yet, or rolled out to much of the UK yet, but we are getting there. So, sorry if my status post upset anyone - I was trying to avoid the calls on Wednesday with people asking why their usage is so high when it was a public holiday. I hope everyone has had a good weekend (we all went to the zoo yesterday, 10 of us). OK, so I am starting to take more of an interest in the labeling on food, and as I was waiting for some popcorn to pop, I read the labels. Interesting. First off, I could not find how much was actually in the product. The labelling is per 100g, but nothing says how many grammes of product there is. I eventually found it where the "best before date" should have been. Three sachets of 90g each. That is a start. But then I was puzzled by how different the two are. The ingredients, as it says, are basically maize, and vegetable oil with some salt (and in one case flavouring and colour). Note that, as I understand it, ingredients are in order. So even if the butter popcorn is 0.67% salt, that means the flavouring and colouring are each less than 0.67%, as you would expect. This leaves the main differences in the ratio of maize and vegetable oil alone. The fact the salted version has more salt (2.8 times as much) is no big surprise. It is "Salted" popcorn. Even so, the salt is a tiny fraction of the contents (0.67% or 1.9%). So how much of each major ingredient (protein, carbohydrate, fat, fibre) must exist in the two key ingredients of maize and vegetable oil? 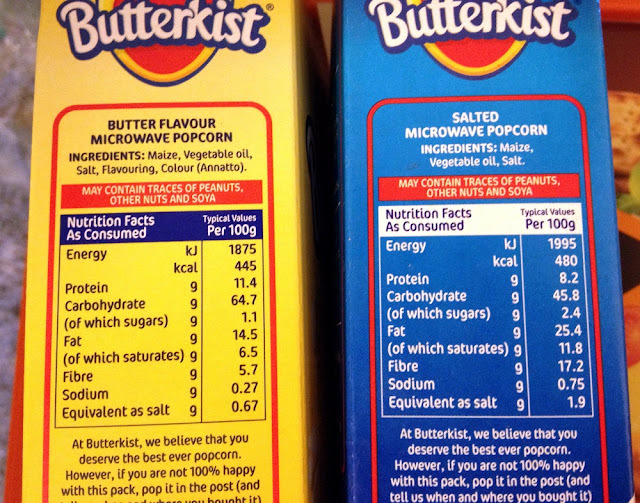 The butter flavour has 39% more protein in it and 41% more carbohydrate, yet under half the sugar and just over half the fat. And where is the fibre from. Correct me if I am wrong but you get no fibre from vegetable oil, so must be from the maize. The butter flavour has 67% less fibre in it. That would suggest 67% less maize. But to be honest, I would notice if there was 67% less maize in my popcorn. Looking at it, it looks like the same amount of maize in each. I am not keen to count the kernels, but on volume alone, it is not 67% different. It seems maize should be the most significant ingredient in either version. Surely vegetable oil is the main source of fat in this, suggesting the salted version has twice as much. So somehow the salted version has twice as much vegetable oil and three times as much maize, or something. I cannot work it out. Am I missing something obvious here? Does anyone ever check this stuff? It is rather interesting that OFCOM are reviewing the whole ADR process, and the fact that some ADR cases have been mishandled. It won't get us any money back, sadly, but is good news. It also looks to have been a long running review, so whilst I expect our case has been a factor we can't really take any credit for OFCOM getting involved. I'll be considering the response carefully over the next week or so. I had an interesting issue this week though, and I think, really, this is a knock on effect of the ADR case, albeit more indirect. The case has created a change in attitude in the whole company, not just my changes to clarify terms and dispute processes, but everywhere. We are all more paranoid about disputes and mistakes. It may seem odd blogging about a case where we did screw up. I can't say it never happens, and we always aim to learn from it. We had a case where a bug in the on-line order form meant the chosen cease date for a line was not handled correctly when a customer was moving house. It meant the cease went in too soon, and they were to be without Internet for 2 weeks. Obviously, there has been some detailed investigation and we believe the bug is rectified now. We made a mistake. From a harsh contractual point of view the answer is simple - we don't charge the customer for those two weeks (even if there would normally be 30 days notice to pay). Not charging when the service is not working is the limit of the liability agreed in the terms. That is harsh, it is a low margin industry, but in practice this is clearly a case where we would offer some good will over and above the contractually agreed terms. I don't want customers inconvenienced because we messed up. However, with a degree of paranoia that I can only assume is ADR induced, one of my staff decided to send the customer a 3G router and SIM to cover the two weeks. This is very very nice of us, and something we have done once for a business customer before (where it was not our screw up that time). Where we do this, we are obviously careful to consider the costs as mobile data costs us a lot more. In this case, we are talking about a residential customer that also has mobile phones with Internet access anyway (not with us). Being without wired Internet for two weeks is clearly inconvenient to them, but did not stop them getting email, accessing web pages, on-line banking, etc, etc. But somehow, nobody mentioned that the mobile data costs a lot, or to use it sparingly, and before we know it we have a near £2000 data bill for this customer. Obviously we are not charging them for this. They were not even told to be careful with the usage. They just used it as they would their normal Internet connection. Ultimately this comes out of my pocket. And really, this is not their fault and I don't want them to feel guilty about it. Had we not had the ADR case I am sure that the 3G router would not have been offered. Yes, we screwed up, but some compensation, even a free installation, would have been much more appropriate for this customer than spending £2k on data. Now I have the challenge of steering the company a little more towards common sense again. At least we have changed ADR now, and the previous lot have confirmed that we do not need to give notice and that the contract is ceased (funny that). OK, well, we got the game client working. They have revised the standard response to involve copying some cache directory. Doing that worked. Everything else, including a full reformat and reinstall of the machine, did not. Of course, having done that, the servers were down for maintenance. Several days later, finally, we managed to actually get on to the game. Though it still takes quite a few attempts to get past the "servers busy" responses. And, what can I say? Overall, pretty disappointing. The graphics are reasonably well done. 3D sort of works - but as you cannot change the angle of view it is pretty pointless. Ironically, and one of the only reasons for trying it, is that James and Julia seem to like it. Seeing as James made it work because I could not be arsed, I got them their own copy. They seemed dead against WoW, but like SWTOR, for example. I can play WoW (though I am not really a dungeon person). SWTOR seemed not as good to me. But compared to either Diablo 3 seems very 1990's. It is a simple 2D+levels map game played mostly on the client and viewed form fixed overhead angle. Basic kill monsters and pick up gold and kit. So, a shame, I am not too impressed with it, and now I have a WoW character 10 levels behind my mate. It also seems odd that the Diablo game servers are so overloaded when essentially it seems they are not much more than DRM platforms. I don't see the WoW servers suffering in the same way, and you would think Blizzard had some clue how to handle this sort of thing now.